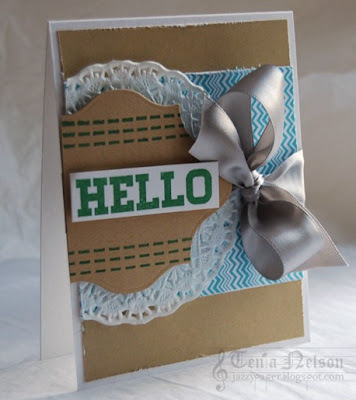 Eclectic Paperie: Big Bold Hello! Tenia here from Jazzy Paper Designs! Hope all is well and Happy Wednesday!! I have a card to show ya and it goes a lil somethin like this......CHECK IT!!! So......I had tons of fun creating this super fun card!! I used the new Market Street Stamps set Great Big Greetings and I had so much fun with the Everyday Eclectic Echo Park papers. I hope you likey and have a great day!!! Great card, Tenia! Love that big ole gray satin bow!! !